I know summer is blooming all around us, but I would love to take you back to springtime for just a little while.... 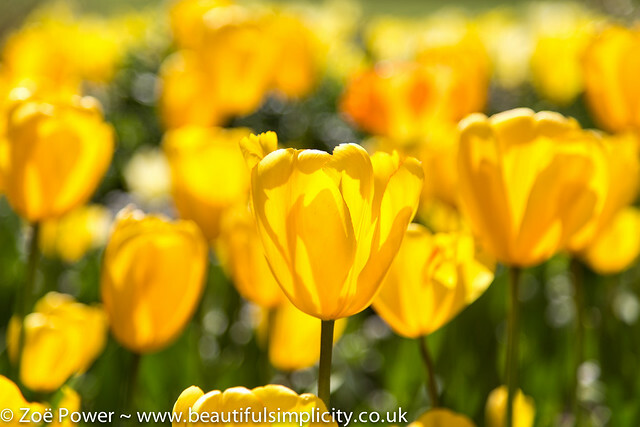 If you're a fan of tulips, then you would love the Tulip Festival at Pashley Manor Gardens - imagine 30,000 tulips (with over 100 different varieties) set in a beautiful garden on the border of East Sussex and Kent. The festival ran from 22 April - 07 May this year (2016) and cost £10.50. This time I visited on a weekend and it was very busy, which made photography a little more challenging, as it was almost impossible to get a shot without someone in it! If you can, I would strongly recommend visiting on a week day - we visited the day before it opened last year as part of a staycation, and it was much more relaxed. But still 100% worth a visit, busyness and all. The tulips are planted/arranged by colour and the complementary planting was just as beautiful. I'm a big fan of pink (no surprises there! ), so let's start with those. The tulips are all really clearly labelled, which is brilliant if you are looking for some inspiration for which tulips to plant in your garden - just remember to bring a notebook - or photograph the labels, as there are far too many to remember. You can even order the bulbs at the festival, whilst admiring a beautiful cut flower display (wish I'd left enough time to photograph this!). If I had to pick a favourite, I think it would have to be Tulipa Angelique, which reminded me of peonies, but the tall slender West Point tulips (further below, in yellow) came a very close second. Whilst the tulips were mostly planted in colour blocks, I loved the subtle combinations and two tone varieties, especially these ones. I had the pleasure of visiting with my sister this year, another avid photographer, so we happily pottered around at snail's pace. We managed at least two circuits of most of the garden - one with my 100mm macro lens (my floral photography lens of choice) and the other with my 50mm f1.4 lens, to capture a few wider shots. Happily there are plenty of places to sit and rest your weary legs along the way - all very pretty too, so the perfect place for a few portraits. And I must just mention the cake! Food and drink are served on the verandah by the manor house and I was very impressed to see a selection of gluten free cakes. Another beautiful place to sit is by the pool. You could be forgiven for thinking you were somewhere in the mediterranean (except perhaps for the temperatures!). Throughout the garden you will find lots of perfectly placed sculptures, all leading the eye to lovely viewpoints or planting. I think my favourites were the ones by the pool. I loved this sculpture too - looking out to a beautiful Magnolia on one side, with the most amazing Wisteria behind it. I would love to have returned a bit later to see it in bloom - it looked like it had been trained in beautiful loops all up the wall of the house. And finally, we should return to the tulips! Let's finish with a little more colour for good measure. A familiar sight, amongst the tulips - you'll spend much of your time avoiding all the other photographers and visitors, so using a shallow depth of field can be very helpful to blur out distractions. This is my sister, though, so this one was intentional (and I'll forgive her for getting in the way!). I thoroughly enjoyed my visit and would love to return next year. There are also several other events throughout the summer - the special rose week is on this week - so hopefully I'll manage to return. You can read about my visit last year or see more photos on Flickr below if you fancy. Do you have a favourite spot to visit for tulips or spring flowers? I'd love to hear - I'm always on the look out for lovely new places to visit.